This piece is proudly made in America with quality craftsmanship, so you can shop with pride and support American based industries. Take pride with this piece in your home that will last for years to come. These fireplace consoles require no venting or gas line, so you can essentially place it anywhere in your home for no hassle warmth. With a remote control, five flame brightness settings, and can be used without heat for 4-season enjoyment, this piece is sure to be a mainstay in your home for years to come. 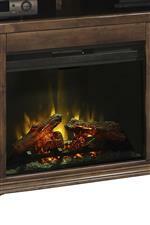 Enjoy the warmth of a fireplace and the entertainment of your television all in one with this fireplace console. The piece is crafted from premium knotty alder veneers and solids in a distressed, aged whiskey finish. The fireplace is extremely convenient, requiring no venting or gas line, can be used with or without heat, plus five flame brightness setting, all able to be controlled by a remote. As storage goes, you receive two top open compartments, perfect for entertainment boxes, plus two end doors with cabinet space behind. The Bozeman Collection Fireplace Console in Aged Whiskey Finish by Legends Furniture at Furniture Barn in the Pennsville, Bear, Newark, Hockessin, Middletown, New Castle, Townsend, Talleyville, Wilmington, Marshallton, Smyrna, Elkton, area. Product availability may vary. Contact us for the most current availability on this product. You're sure to find a suitable TV stand in this collection of casual yet beautiful consoles. Constructed from premium veneers and solids, you know you are receiving a durable piece that'll last for years to come. The Bozeman Collection collection is a great option if you are looking for Casual furniture in the Pennsville, Bear, Newark, Hockessin, Middletown, New Castle, Townsend, Talleyville, Wilmington, Marshallton, Smyrna, Elkton, area. Browse other items in the Bozeman Collection collection from Furniture Barn in the Pennsville, Bear, Newark, Hockessin, Middletown, New Castle, Townsend, Talleyville, Wilmington, Marshallton, Smyrna, Elkton, area.